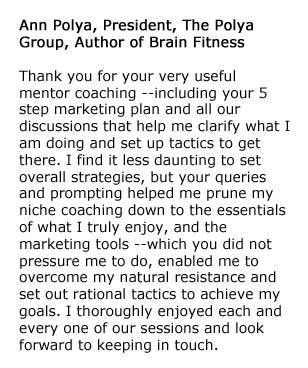 Thank you for your very useful mentor coaching –including your 5 step marketing plan and all our discussions that help me clarify what I am doing and set up tactics to get there. I find it less daunting to set overall strategies, but your queries and prompting helped me prune my niche coaching down to the essentials of what I truly enjoy, and the marketing tools –which you did not pressure me to do, enabled me to overcome my natural resistance and set out rational tactics to achieve my goals. I thoroughly enjoyed each and every one of our sessions and look forward to keeping in touch.